At the risk of editorializing, I really enjoy playing Bushido (even though I've not really had a chance to do so in quite some time). It's sad how far behind I've gotten on releases, considering how much I love the game. But waddyagonnado? Seems I'll be just a little bit more behind as Wave 27 is now available for pre-order over in the GCT Studios webshop. Along with the pre-orders, GCT has also created some web-store-exclusive terrain/objective pieces. Those that have played the game know that shrines and such play a big role in many of the scenarios for the game. 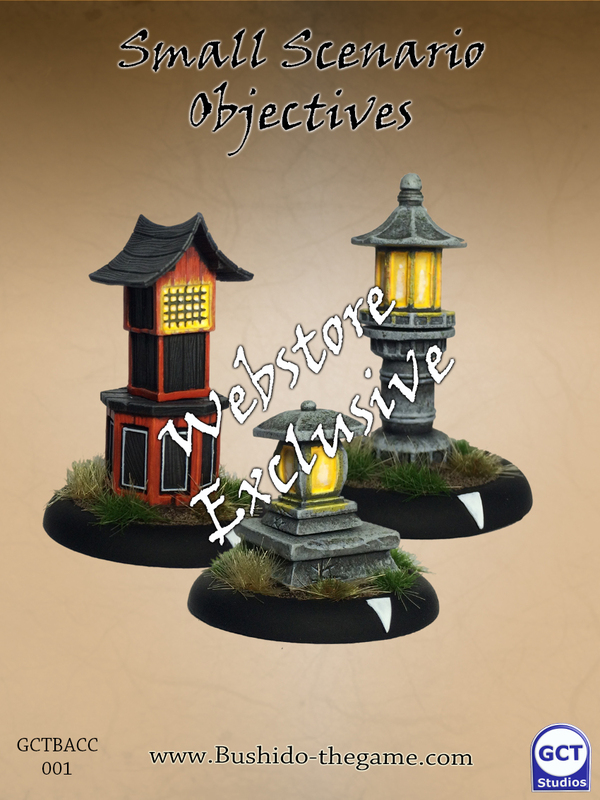 As such, GCT has created several little shrines and lanterns that you can now order to add a bit of 3D to your shrine objectives in the game.